Reddit has introduced a new account suspension system to punish users who violate the site’s content policy. Suspensions will replace shadowbans, which previously caused users’ submitted content and user profile page to be visible only to themselves while logged in. Users weren’t informed that they were banned and had to go through an unstructured process to request Reddit administrators to lift the ban. With the new system, users can only be suspended by Reddit’s official administrators and not the moderators of any subreddits. They will also receive a notification in their inbox as well as on the front page that explains the reason and duration of their suspension. When you’re suspended, you can’t vote or comment on posts, or submit new ones. You also can’t send private messages to other users. Subreddit moderators who have been suspended won’t be able to perform moderator actions like removing posts and blocking users, and won’t be able to access private messages from users intended for moderators (and not their user profiles in particular). To appeal the decision, suspended users can reply directly to the private notification message. This keeps all case information on the same conversation thread, so it should be easier to discuss and take action on appeals. 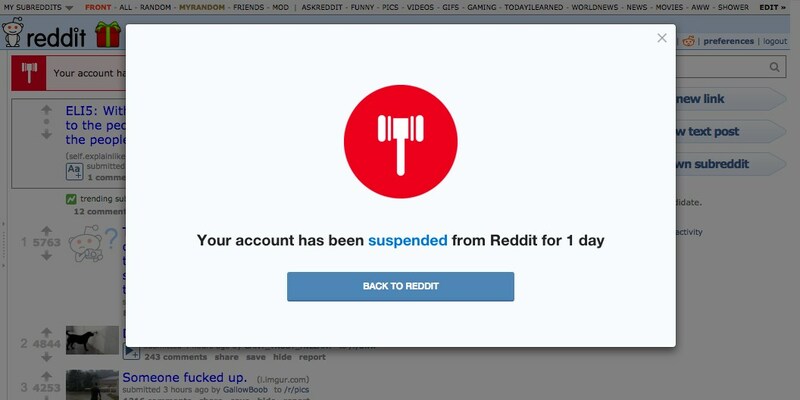 Reddit says it will generally issue suspensions that range from three to five days, depending on the severity of users’ infractions. In more serious cases, users will be permanently suspended but still be allowed to appeal the decision and recover their account and content. The previous shadowban system was designed with the primary intention of making spam bots useless: when a user account was spotted flooding the site with fake or promotional links, it was shadowbanned so everything on the site would seem normal from its perspective, but its posts wouldn’t be displayed to other users. As a result, spam rings wouldn’t attempt more complex methods of getting their content onto the site. The company believes that the new system is more transparent and user-friendly. It’s still hammering out kinks in its new rules and is taking suggestions in a discussion thread, where users are requesting more power for suspended subreddit moderators so they can keep their communities running as usual while they appeal their case.